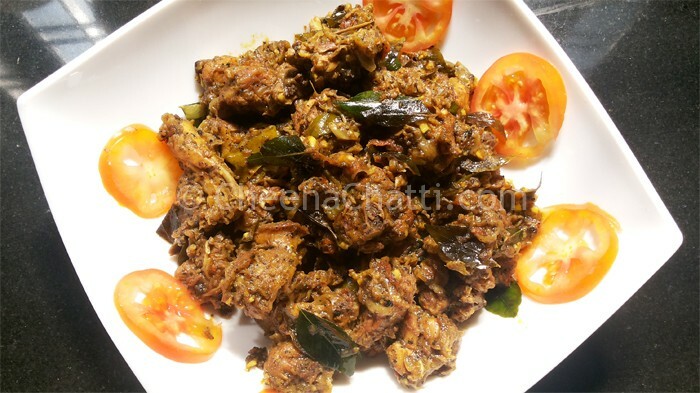 Pepper Chicken is a very popular side dish in Kerala restaurants. Its one of the dish we frequently order from our nearby hotel. Though I tried a lot of pepper chicken recipes in the past, none of them were successful. Recently I came across another recipe of pepper chicken, in a local food magazine and I tried it same day. The preparation was a finger licking one and hence I thought of sharing the recipe with our friends here. Try this recipe and let me know your reports too. Crush the peppers and keep it aside. Marinate the chicken with the pepper powder, lime juice (or vinegar) and salt. Keep it in freezer for 4-6 hours. In a pan heat oil, add the sliced onions. Saute it till they become brown. Add the crushed ginger, garlic, curry leaves and the green chillies. Saute it well for 3-4 minutes. Add the garam masala, chicken masala, turmeric powder and fennel powder, add tomato sauce and soya sauces. Mix it well. Add ¼ cup water, salt and the marinated chicken pieces. Mix everything well and make sure that chicken pieces are thoroughly coated with mixture. Lower the flame, cover it with a lid and cook it until the chicken is done. Stir it in between. Once the chicken is cooked, add some curry leaves and cook for another 4-6 minutes. Transfer it to a serving bowl and garnish with leafy vegetables, lime and onion. Have you seen other chicken recipes? This entry was added on February 11th, 2014 by Renoos in Non Veg and tagged with pepper chicken recipe, pepper chicken dry, indian pepper chicken, spicy chicken fry, easy chicken pepper fry, pepper chicken, chicken pepper fry, kerala chicken, pepper chicken dry recipe. Last revised on April 4th, 2018.